Can you easily get pregnant with twins ? here is some information on how to help increase the chances of having twin babies. There are two types of twins; identical and non-identical. Identical or monozygotic twins are formed when one egg is fertilized by one sperm. Then it divides into two separate embryos. Each shares exactly the same genetic components and identical genetic structures. Identical twins also share a placenta. Non-identical or dizygotic twins form from two separate eggs being fertilised by two separate sperm. These twins are unique little individuals. Twins share no more genetic composition than siblings with the same parents. Each baby in a non-identical twin pair will have its own placenta. Another name for non-identical twins is fraternal; the other name for identical twins is non-fraternal.. The genetic predisposition for having twins only applies to the woman. It is her family history which influences the chances of her having hyper ovulation. Being older than younger can help to get pregnant with twins. if you have already had a big family that can also increase the chance of twin pregnancy. If you already have a set a twins and don’t mind having more twins because the odds are in stacked in your favour . can diet help get pregnant with twins ? Its thought that eating diary products helps. eating yams increases the chances of getting pregnant with twins.Being a twin your self increases the chances of getting pregnant with twins. using ivf to get pregnant ? because having ivf treatment can increase a chance of having twin babies. So you’re wondering if you’re pregnant with twins ? if you have been pregnant before.When you have another pregnancy it may show faster because a uterus and ligaments stretched. A pregnancy with twins may have larger faster weight gain due to an increased blood volume and the uterus size by the end of the second trimester. a pregnant woman that’s having twins will have gained 15 to 25 pounds where’s if you wanted pregnant with one baby you usually gain 10 to 20 pounds another way of finding out if your pregnant with twins is measuring large for gestational age, when the Midwives measure your stomach.a scan result can reveal a twin pregnancy. pregnant with twins can result in the morning sickness. morning sickness can be more severe when carrying twin babies. if your pregnant with twins you may feel the baby is kicking earlier . and a scan it could detect a heartbeat for twin babies as early as 10 to 12 weeks of pregnancy. another sign is extreme fatigue because the mother’s heart as to work harder being pregnant with twins. a pregnant with twins means are you at high risk in your hospital notes. can things go wrong with a twin pregnancy yes ? here is one example that can go wrong in the Twin pregnancy twin to Twin transfusion syndrome also known as TTTS.So what is twin to twin transfusion syndrome? Ttts is a disease of the placenta which affects identical twin pregnancies, the placenta contains abnormal blood vessels which connect the umbilical cords to the twins . If too much blood flows to one twin it can put a strain on baby’s heart one twin gets too much blood flow and the other twin does not get not enough. Twin babies are closely monitored. sometimes surgery is needed whilst the babies are still in the womb. a laser seals off the abnormal blood vessel.its to separate the twins so they get equal amounts of blood flow. without treatment some twin babies cannot survive. because a twin pregnancy is classed as high risk the babies may be born prematurely. is your body known to have an incompetent cervix ? if you are pregnant with twins you will need to have a stitch in your cervix. its to stop the cervix opening and going into premature labour too early.You will be closely monitored. its because you are pregnant with twins. so if you are pregnant can you deliver twins naturally ? you can discuss the best options with your midwife, you will probably be advised to have babies in hospital due to complications with associated with delivery. if the babies are in the transverse position and do not change position close to the delivery date a c-section will be performed. Will you be offered pain relief for the delivery of twins ? yes you may want to opt for an epidural speak to your midwife about it in your birth plans. 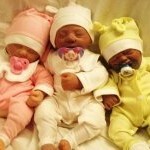 A premature birth is more likely due to a multiple pregnancy of triplets. Twins may come slightly earlier than 39 weeks but the more babies that are carried inside a womb at once the more higher a risk pregnancy it is for the mum to be. As soon as a multiple pregnancy is diagnosed as in the case if triplets more frequent antenatal visits may be necessary. Finishing work early is advised, bed rest, or even a short stay in hospital towards the end of the pregnancy to give the babies a much better chance of gaining weight and maturing inside the womb. A premature birth is mainly caused by the fact that multiple babies will stretch the womb quicker than a baby. The cervix may begin to open earlier than would be expected by one baby. Mums with multiples babies 4,5,6, 8 what’s it like with a large multiple pregnancy. Pregnant with twins mean double the morning sickness.Pregnant with triplets 3 times more. imagine what it would be like carrying 5 6 7 or even 8 babies. lets take a look at some mums who have done just that. On The 18 November 1983 the world’s first all-female surviving sextuplets were born the girls are Hannah, Luci, Ruth, Sarah, Kate and Jenny Delivered at at Oxford Street Maternity Hospital, Liverpool at 31 weeks By huge team. Jennifer Rose, 3lbs 8ozs.Mum had no idea what to expect at the birth but decided to take each day as it comes even to this day 27 years later. more pregnant with multiples stories .. The Gosselins family was impeded by infertility. Kate was diagnosed with polycystic ovary syndrome. After fertility treatments. In February 2000, Kate became pregnant with twins. Cara Nicole and her sister Madelyn Kate on October 8, 2000. In October 2003, Kate became pregnant again. Five weeks later, the doctor announced that there were six sacs with seven yolks The sextuplets were born on May 10, 2004, ten weeks premature, in Pennsylvania. The babies were named Alexis Faith, Hannah Joy, Aaden Jonathan, Collin Thomas, Leah Hope and Joel Kevin. All six delivered via C-section with 75 doctors, nurses and other specialists involved. Mum now has her own tv series featuring her 8 children after splitting up with her husband Jon. you eat loads.You will have to give up work early as carrying so many babies puts a strain on your own organs overworking.rest so pregnancy can progress for as long as possible. risk of premature birth inevitable due to so many babies in womb and valuable nutrients given to each baby through placenta. many visits than usual to see the midwife and doctors. more scans than a normal single pregnancy. Live birth uncertainty for all babies due to prematurity and womb size /problems. No natural delivery all babies need to be delivered via c section due to size of babies at birth and complications.